First published in the Westmorland Gazette in the 1950's, Alfred Wainwright's Pictorial Guide to the Lakeland Fells comprises seven volumes listing 214 mountains and tops - each with its own chapter. Often considered the definitive Lake District list (and the one most people start with) all The Wainwrights are accessible to the average fell walker. If you LOG ON and then RELOAD this page it will also display how many Wainwrights in each region you have already climbed, bagged & conquered. When publishing his mountain guides Alfred Wainwright divided the Lake District into seven areas. High Raise, The Langdale Pikes . . . Peak Bagging the Wainwrights is a way of discovering and experiencing new mountains, peaks, tops and hills that you might have not otherwise thought of walking on - often in glorious solitude well away from the crowded honeypots. To get started, see Peak Bagging the Wainwrights - how to get started or click on each link below to download an Adobe Acrobat (pdf) document containing a Location Map and Tick List of all the Wainwrights, Mountains (Hewitts) and Hills (Bridgets) by area. On each one you will find room to record which mountains, peaks and hills you have climbed (or 'bagged') and offer mouth watering inspiration for your next walk. Also available are special versions of the above Lake District Peak Bagging Maps and Tick Lists that include the 59 walks that visit all 214 Wainwrights. 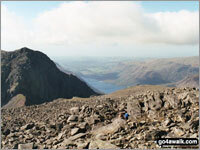 To download each one - click on the relavent Peak Bagging Maps and Tick List link above. For more information on how to get started and Mountain Tick Lists and Peak Bagging Maps available for other areas of England, Wales and Scotland click here. *A free example peak bagging map and tick list is available via a link in the current edition of our regular newsletter - click here to get your copy now!